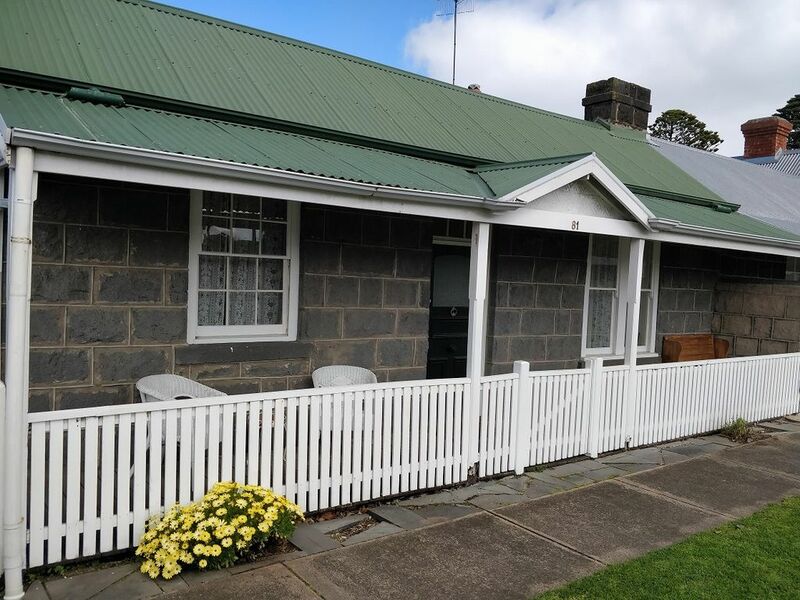 'Pips on Bank' is an historic cottage built in 1867 that we have renovated with the desire to ensure your stay is comfortable, inspiring and one to remember. We have maintained the original features of the cottage (including the very low doorways in the rear bedrooms, (please remember to 'duck') and brought them to the 21st century with a little eclectic styling and artistic flair. Pips on Bank boasts 2 Queen Bedrooms and another with 2 single beds, all with new beds, furnishings and luxurious linens. Our cosy lounge offers an open fireplace to relax by on a winter weekend with a wine and a good book from our small but growing library. Games, DVDs, activities are also available for your entertainment. A HD TV and a fabulous Bluetooth sound system along with free WiFi, quietly blend into the ambiance and only add to your holiday comfort. We offer a light filled kitchen with all of the conveniences required for preparing wonderful meals or simply a fabulous morning coffee. Please feel free to use the herbs that are in season in our kitchen garden. The dining room features the stone wall and fireplace from the original cottage kitchen and through the french doors will open your dining experience out to the alfresco. Outdoor furniture and BBQ are available for sunny breakfasts or balmy evening get togethers. The backyard provides an abundance of lounging on the lawn space, or the perfect area for a family cricket match! Our bathroom offers both a spacious shower and freestanding bath for your convenience and enjoyment. Port Fairy would have to be considered the jewel of the South West Coast, only 250km from Melbourne CBD and easily accessible by rail and bus. There is no excuse not to visit for a short break or a longer week of summer fun. Pips on Bank is located 500m from the first of many hotels and restaurants. Continue a little further and you will find cafes, bakeries and a lovely little shopping village. It is the perfect stroll to a deliberately slow and luxurious brunch on a weekend, or an easy distance to walk to dinner and enjoy a drink! We are located between the two popular beaches and wharf precinct where a popular local market is held and close to the public transport routes. Everything is accessible by foot when staying at Pips on Bank. A great excuse to park the car in the drive and walk or, alternatively bring along your bikes for easy riding and exploring. Port Fairy is part of the Shipwreck coast and offers an abundance of exciting history, wonderful landscapes and beautiful architecture. From the charming Bluestone cottages like ours to the rugged and treacherous coastline of 'The Crags' there is never a shortage of attractions. Summer fun at the two pristine and patrolled beaches, cycling along the bike trail to Koroit, discovering the lighthouse and Shearwater Colony, fishing, surfing or wandering through the village and pausing at an award winning cafe or restaurant on your stroll home....... a stay at Pips on Bank will offer a relaxing and comfortable base for all of your activities. Come and enjoy the galleries, the markets, the Port Fairy Folk Festival or 'Winter Weekends' all of which contribute to the inspiring and creative nature of the town and its people ......we can't wait to meet you! * NOTE - 3 Night Minimum Stay - 2 Night Winter Weekend on arrangement. NO Overnight Stays. A short walk to both the Surf Beach (east) and 'Pea Soup' beach (sheltered and calm family beach). Pips is between the two at 1.5km to each one. Our cottage is part of the original Port Fairy village. A short stroll will bring you to the start of the town shopping and cafe precinct. A collection of beautiful fashion, wares and food to enjoy! We had a most enjoyable stay at Pips on Bank. The charming little cottage was ideal for myself & my elderly parents for a few days away, while the weather was still pleasant. Port Fairy is a lovely base in South West Victoria for trips to nearby Warnambool, Hamilton and Portland, then return to Pips on Bank to relax. A very cute, well equipped cottage - nice and close to everything you need. The house had everything we needed for our stay and was very comfortable - especially the beds! The only thing we were missing was a couple more heaters for nights and mornings - it was quite cold while we visited. The enclosed yard was perfect for our toddler to play in. We all had a very relaxing stay and would definitely go back. We had a great time at Pips on Bank, despite the South West turning on the winter weather for this part of the trip. Well stocked kitchen, nice comfortable beds, beautiful garden and a nice place to stay. I only sconed myself a couple of times on the doorways (after that I ducked automatically for every one) and we had a great time. Some proper firewood/kindling would have helped keep the house warm but otherwise all good. A wonderful cottage, beautifully presented, comfy beds and everything that you would need for a great few days away. So glad that you enjoyed your stay, I love to hear that we hit the mark for presenting somewhere that is cosy and beautiful! Look forward to your return! We stayed at pips for two nights and it was gorgeous, a sweet little cottage that's a complete home away from home. Fully equipt kitchen and room for everyone. We loved using the fireplace on the chilly winter nights. Would absolutely stay again. Pips On Bank is a stunning place to stay in Port Fairy. So beautifully presented, welcoming & sparkling clean. Lovely touches wherever you look, & the garden was fabulous. Loved it! So great to hear that you enjoyed your long weekend! I am glad that the little things that I like to share with guests make them happy! Come back and see us again anytime!